Well, the night has finally arrived. Zach Attack's stay in the BB house is potentially over. There wasn't a lot of game to report tonight. Most of the night the HGs were together talking about movies and life and such. Zach decided he has made peace with this being his last night and that he is actually a little excited to go to the jury house, sleep in a hotel room, and possibly get to have some kind of contact with his family. He decided to make his last night fun with no campaigning and came up with a new look for himself for his eviction. Caleb and Derrick commented a lot about how much they are going to miss having Zach in the house while Cody, Christine, and Frankie cannot wait for him to be gone. Christine did mention that she made a really nasty goodbye message and may regret it now. I really don't understand how Derrick is the only one of these people smart enough to work on jury votes. Speaking of Derrick, Victoria managed to corner him finally and talk with him about how she is jealous of how much time he spends with Christine lately. Derrick did what Derrick does and basically talked her down without actually talking, but honestly, their relationship does seem different lately, and I'm not sure if Derrick is still as set on keeping her as his final 3 goat anymore. Victoria may actually be going sooner than we think. Cody was also having jealousy issues with how much time Christine spends with Frankie and he made these known. Christine apologized many times over and by the end of the nnight they seemed to be ok again. The plan as the HGs see it is for everyone to go after Donny again. It's literally all of them against him (except they don't know about the returning jury member tomorrow). Donny made the mistake of talking to Christine early in the day when they were the only two awake. He talked with her about the idea of her being low man on the totem pole in their alliance and about the idea of working together instead of against each other. Donny implied that Derrick talks to everyone every day and that he has a lot of friends in the house. He also told her that when he spoke to Zach about the pecking order, Zach thought Christine might be next to go home after him. He asked her not to mention his name to any of the rest of her alliance because that would really screw him, and she said she never would. Ten minutes later Christine ran to Cody and told him everything Donny said plus added a lot of not true things to it to get things really stirred up. And thus began the game of telephone about Donny. Not that it matters, Donny was the next target anyway. The thing about Christine (in my opinion anyway) is that she could be an AWESOME pot stirrer if she would stop stirring BACKWARDS! When you stir the pot against people like Zach and Donny that the house is already against, it really doesn't do anything, but if she were to stir it up against Frankie to Derrick and Cody and vice versa, it would sit her pretty in the middle. That's not a bad place to be if those guys go after each other. I'm just not sure if she will ever do it or not. This long season really needs someone to shake things up a bit, so I pray that whoever DOES get to come back from jury will do something interesting and go after the people who have not even been on anyone else's radar. I would LOVE to see Frankie follow Zach to the jury house after everything he put him through and all the joy he got out of evicting him, but I rarely get so lucky. I feel like Frankie is there to stay. I like wat Donny did today throw out bait see who bite and if somebody told then he know how close they really are to one another in they alliance I want Zach back but if not him Nicole or anybody but jocasta cause Donny needs help to go against them.also it might have been a bad idea for Donny to talk to Christine but he has nothing to lose at this point but why there bashing him Derrick seem really worried that one of them might believe cause everytime somebody walks by or he by his self he's asking about Donny. he even tried to play to Christine that he is a floater just like her cracks me up. and let me just add Cody is the biggest whining guy I've seen on BB all he do is complain all day long and he kills me with his im going to call somebody out crap me & my sister call him Scrappy Doo all bark no bite lol. Let me start with, I understand it is a game. 100% understand that you cannot be honest and a nice person to win this but seriously? This whole group is taking it to a new extreme. Regardless of me liking Zach, it could be anyone else and it would still upset me. I really wish production would stay out of it!! Zach alone will get them the ratings they want but nooo...thanks to their interference, he will no go home. Personally, I would like Zach or Hayden to come back. Everyone in the house liked him and the idiots wanted to work with him so what better person to bring in and help Donny? I would love to see that joke of a woman Christine to leave asap. I think I may actually like Victoria more than her and Victoria just breathes and cries. At this point, I really do not care who wins as long as it is not Frankie. Charity or not (which I really do not believe) he is a horrible person and has just about ruined this show for me. I am just ready for next season and cannot wait for this to be over! Frankie is a attention getting creep...if he is not yapping constantly about himself he is throwing himself bodily on anything with a pulse...if I was a male in this house, the first time he draped himself over me would be his last or mine because I would be evicted for punching his lights out. It has dawned on me that while people call Victoria a useless floater they are overlooking another. Cody. WTF has he done in the game? Has he won anything? Hello? Where are y'all? I thought website was broken, but ticker's current. So, what gives?? I can't stand Frankie he's such a douce bag if I was zach and he talked to me like he did him sometime I would have punched him in the face; not to mention if it was other guy talking that way to a girl the production team would say something. Frankie should have been gone along time ago wtf.Im so glad Nichole is back I hope she doesn't go on the block anytime soon and I .hope Donnie doesn't go home I wish Christian would go home or Frankie. My apologies, but something more important came up shortly before showtime on Thursday night so I didn't get a recap done. Tuesday - catching you up. 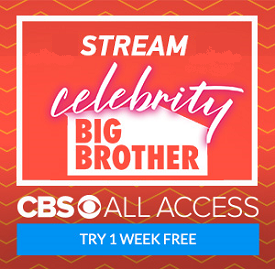 Does CBS Condone Abusive Behavior?